Deadliest Catch is a hugely popular TV series on Discovery Channel. This reality show portrays the tough men of crab fishing vessels on the Bering Sea. I wonder if these daredevils would still be so tough if they had to jump in the raging Khone Falls for a handful of fish. Because that’s the daily routine for some fishermen in Southern Laos. As the sun starts to set over the 4000 Islands in southern Laos, Ronald and I start to worry we might be in the wrong place at the wrong time. A couple of fish traps, constructed of wood and bamboo, indicates that there must be some sort of fishing activities going on, but we’ve been here since three o’clock in the afternoon and so far we haven’t seen a living soul. Just as we’re about to give up and head back to our guesthouse (even in broad daylight, the bike ride across the muddy island of Don Khone is a risky undertaking) a few Lao fishermen emerge from the jungle. The game is on. From the shore it’s impossible to tell if any of the cages contain fish. So the fishermen take a big leap and holding on to a rope with one arm they use the other to check the traps for fish. If they lose grip, the violent falls will sweep them away instantly. After dangling in the stream for almost ten minutes, one of the fishermen raises his arm, triumphantly showing us a humongous catfish. His colleagues break out in joyful exclamations, excited as they are about this big meal. A little later they are back on the shore, proudly weighing their catch of the day. It’s a solid nine kilograms. In a cheerful mood they make for their way home, where they will undoubtedly celebrate their success with cigarettes and a big bottle of Lau Lao, the locally distilled whiskey. 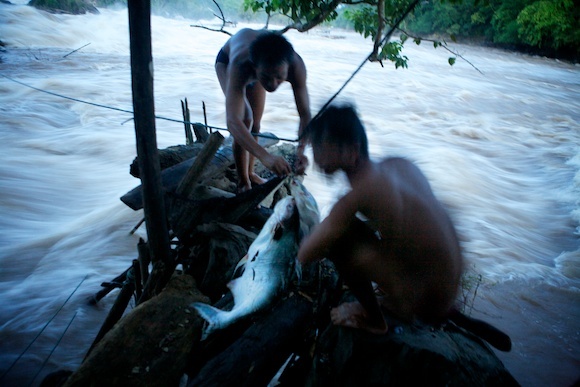 Risking your life in the Khone Falls just to catch a daily meal seems to me like a rather extreme way of life. And these guys are no TV celebrities, they don’t drive fancy cars and nobody is asking for their autographs. To me, however, this truly is the Deadliest Catch.